This post is sponsored by fairlife ultra-filtered milk, all writing and opinions are my own. I share this easy and healthy breakfast recipe below! Are mornings in your household crazy for you as well? I value my sleep and try to get as much sleep as possible (while being a night owl because I value my alone time even more). So I’m not one of those mom’s that will wake up at 4 am to go to the gym, shower, read or listen to an uplifting book or a podcast, then dressed and makeup ready with a hot breakfast ready by the time the kids wake up. I know there are these moms out there and I admire those moms greatly and think they’re amazing! It just isn’t realistic for me and will probably never happen. I wake up when the kids wake up. Then I have about 30 mins. 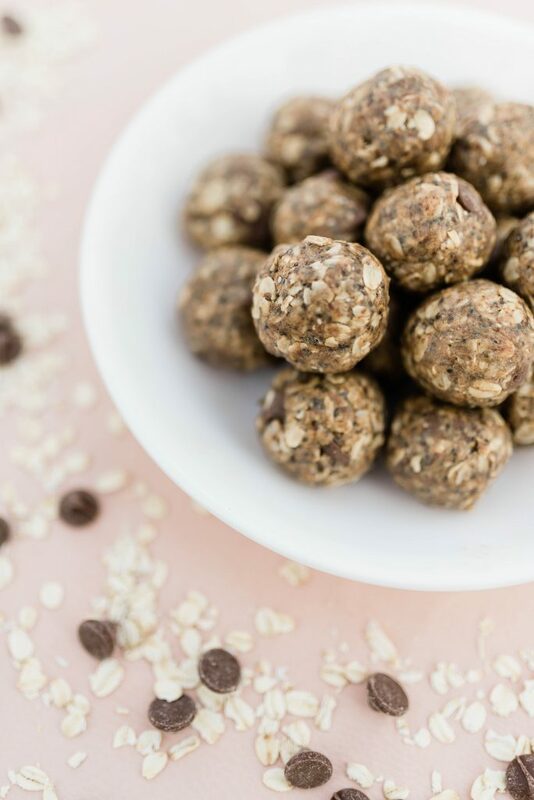 to make their breakfast and pack their lunches so it can get a little hectic, which is why I have my go to breakfast that I will share with you below that is super easy to prepare the night before or weeks before in advance to freeze, and my kids love them! I serve it with a glass of cold fairlife ultra-filtered milk, and bam, there is your complete breakfast. 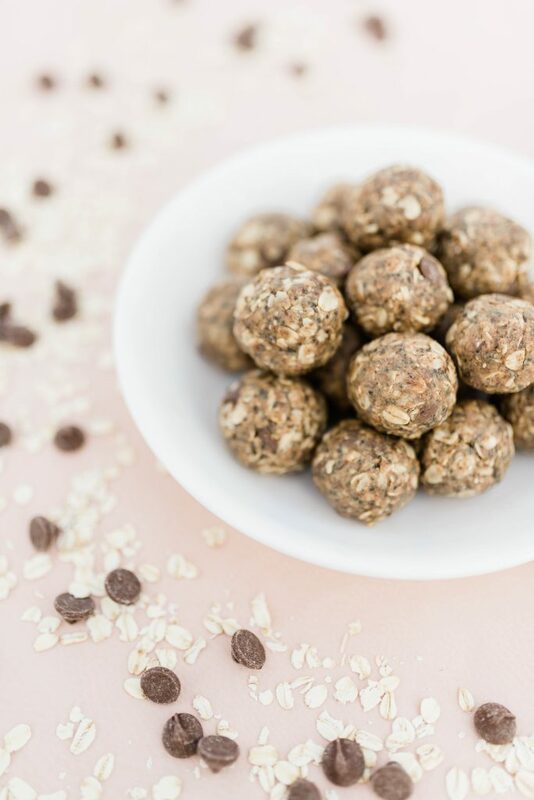 While these energy balls are pretty filling themselves, I love that with the 50% extra protein and 350% less sugar found in fairlife milk compared to regular milk, it keeps my kids’ tummies full and content. fairlife comes in fat-free, 1%, 2%, whole milk as well as chocolate milk that my husband likes to drink after a work-out, which is the whole reason why our family was introduced to the fairlife milk in the first place! 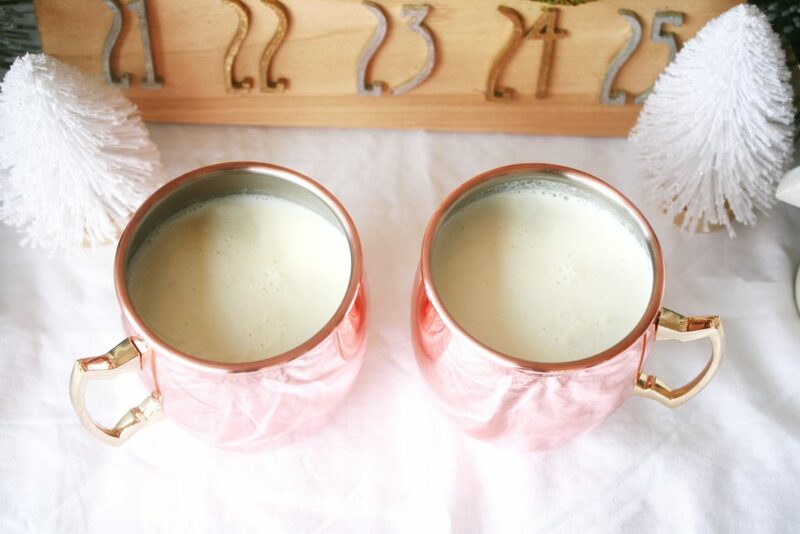 So I invite you to try this easy recipe and pair it with fairlife ultra-filtered milk! My kids have told me they feel like they’re eating cookies & milk for breakfast, which is why it’s their favorite breakfast. 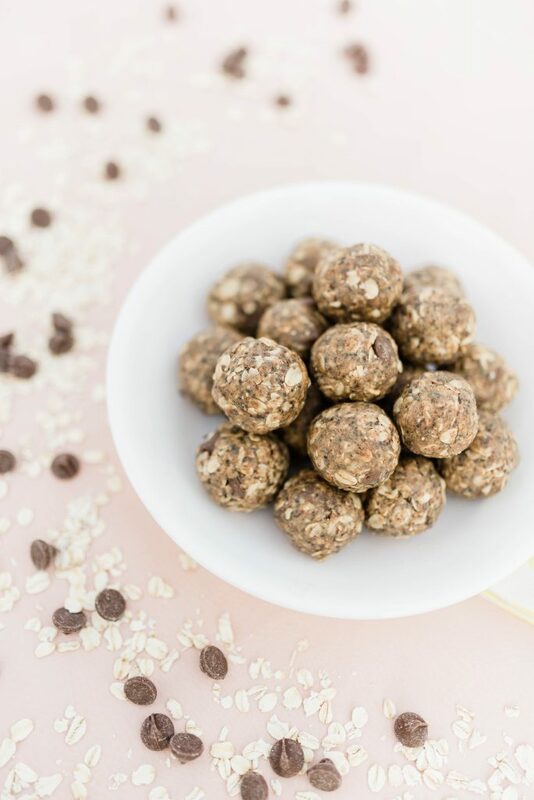 And just like cookies and milk go hand in hand, these healthy energy balls go hand in hand with milk. Combine all the ingredients and mix. Form into a 1′ ball and freeze overnight. What are your go-to, easy breakfast recipes? Feel free to share in the comments below! My 4-year old son has the best pick-up lines, so much that I worry sometimes. He’ll say things that are so incredibly smooth and sweet, and way too advanced for his age! He only uses them on me thank goodness but one day he’ll be using it on other girls and that is just something I am not okay with. •Me: “Are you playing footsies with me?” as we were on our lunch date. The sweetest, right? So tell me, is he super smooth for his age? Should I be worried? I hope he never stops(but only with me)! 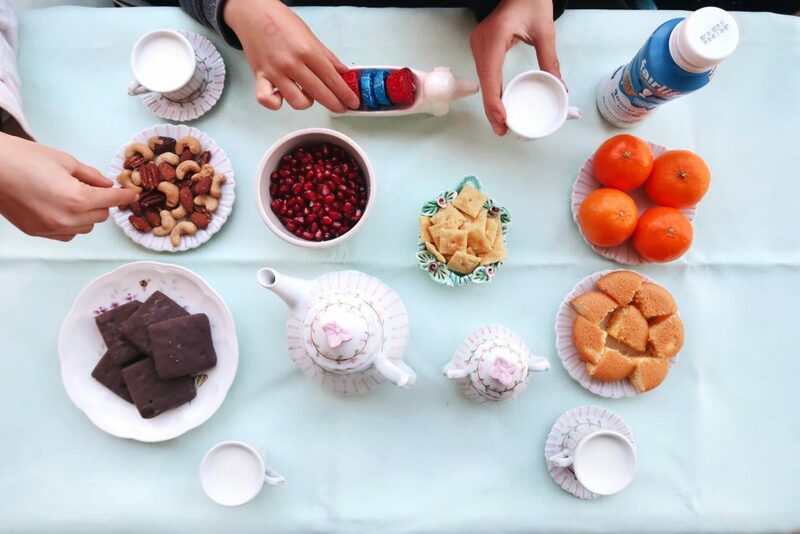 He’s been asking to have a tea party the past few days so I surprised the kids with an already set-up tea party when they got home from school, using fairlife® DHA to make the tea. I’ve surprised the kids with a tea party once before and it makes them so excited! Since it was super cold, I made hot milk tea which is a tea I grew up drinking in Korea. They have vending machines out on the side of the streets that sell hot coffee or hot tea, I wish they had them here! For only 10 cents, I would order the milk tea and the paper cup plops down, then the hot tea gets poured right into the cup. So it brings back such nostalgic memories for me and I make it all the time with my kids, they love it too! 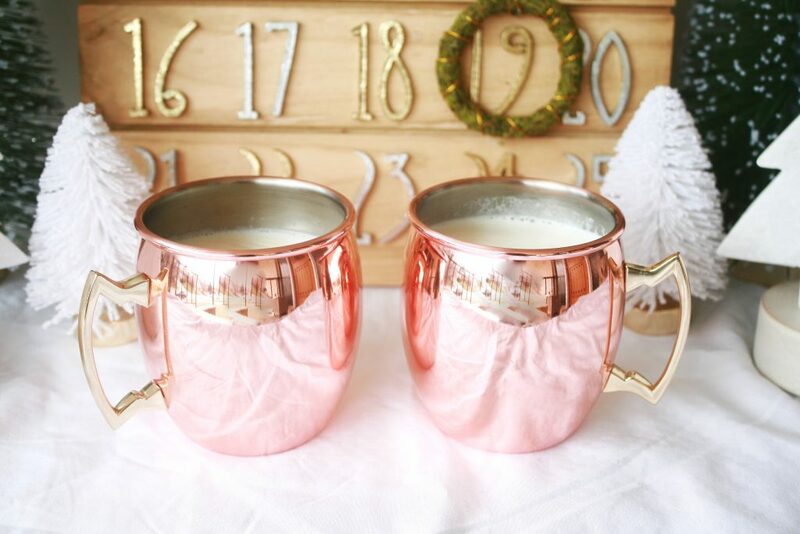 And it’s so easy to make with only 3 ingredients! Boil the milk. Make sure it doesn’t boil too long that it boils over. Pour in the cream and the sugar and mix. I told you it was easy! fairlife DHA tastes better and has better nutrition with 125mg of DHA, 13g of protein, 50% less sugar then ordinary milk, and it’s lactose free. And one cup of fairlife DHA has 35% of the daily value of calcium! 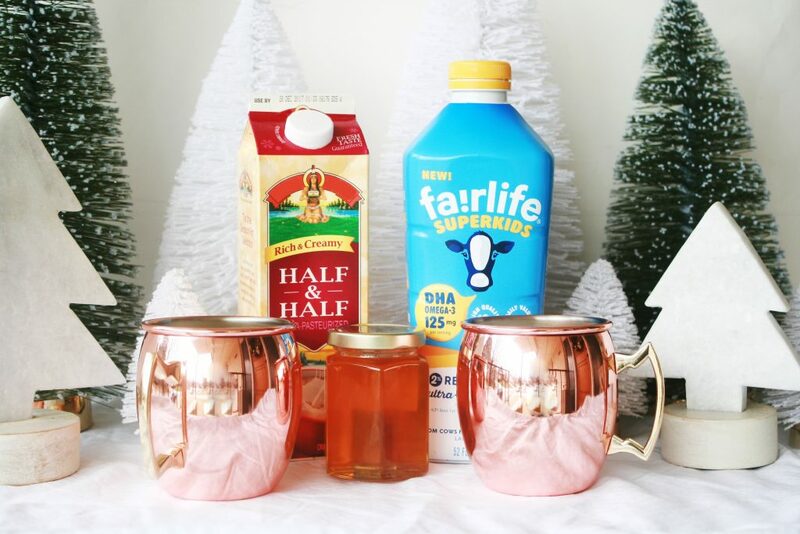 I used DHA 2% milk in my recipe, but they also make fairlife DHA Chocolate milk too! Now go make it for your kids, they’ll thank you! A VIDEO OF MY TRIP TO INDIANA! This post is in partnership with fairlife. I feel pretty lucky to have had some amazing opportunities to travel as a blogger such as traveling to California and meeting some of the most influential producers and content writers of Hollywood and seeing sizzle reels of potential upcoming T.V shows, dining at Sam Walton(the owner of Wal Mart)’s home and Lionel Richie’s prior home that overlooks the beautiful city of Los Angeles(the dinner was fancier than my wedding, guys), traveling to Bentonville, Arkansas and having a private concert by Jewel and talking to her for 20 mins., just me and her about the true purpose of life and how the universe works(we just got each other and now I am one of the 46 people she follows on her Instagram account, and the only one she followed out of all the other bloggers she met, can you tell I’m so flattered? ), traveling to Orlando, Florida with my family for Disney Social Moms 2016 and also this February we get to go to Disney Social Moms again to Disney World and also on the Disney Cruise to the Bahamas. A few months ago I also got to travel to fairlife‘s flagship farm in Fair Oaks, Indiana along with 4 other bloggers to see the behind the scenes and how they run their farms and produce the fairlife ultra-filtered milk. Jay had bought fairlife ultra-filtered chocolate milk (which is delicious by the way) several months prior because he said it looked really good and had 1/2 the sugar and more protein than ordinary milk, which was good for building muscles as he started going back to the gym regularly. My kids and we all loved the taste of the milk so we were fans of it, then a few months later I was contacted to work with fairlife, and I was so excited! Before I accepted the offer to travel, I looked into fairlife and researched to make sure the company was a company I could stand behind and honestly recommend to my readers. What I didn’t know is I was going to be about 20x more impressed with fairlife and fall in love with the founders behind it, more than I could have imagined! Watch the video first, and then I will talk more about my thoughts on the trip. 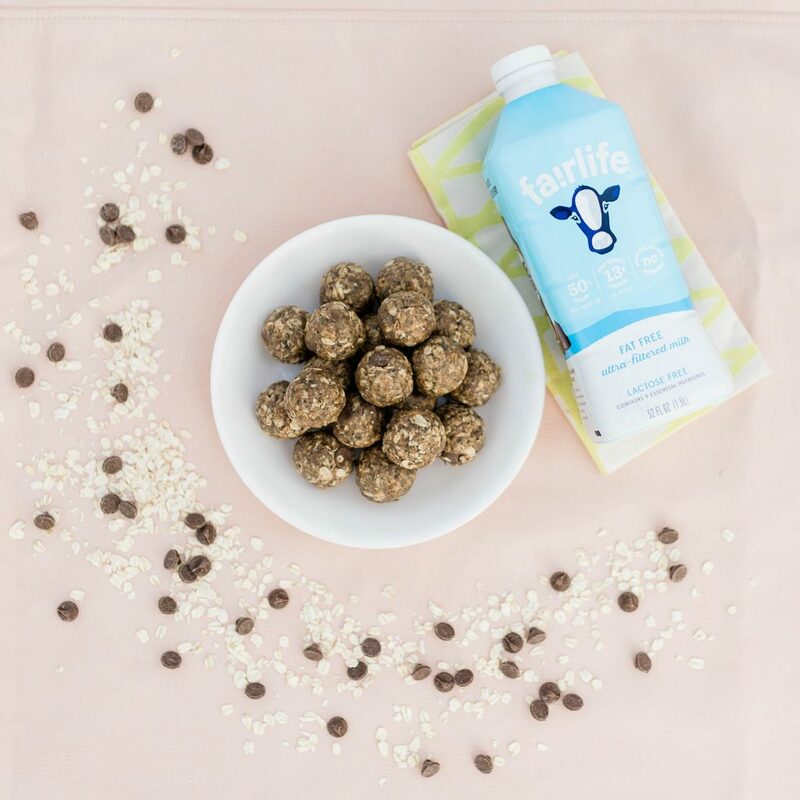 Are you in love with Sue, the c0-founder of fairlife yet? I sure did! She was such a graceful, humble and down-to-earth lady and very genuine and passionate about what she does, we couldn’t help but to admire and fall in love with her and what she does. As she talks in the video, none of it was scripted, she just spoke from her heart every single time. Here are my favorite facts I’ve learned about the fairlife ultra-filtered milk during the trip. Ultra-filtered milk might sound unnatural and it does raise skepticism among some people. I wondered if natural was better, just the way nature intended it to be but I was reminded that all the milk that we drink right now are filtered too, they filter out the fat for 2%, 1% and skim milk. So all milk is filtered! 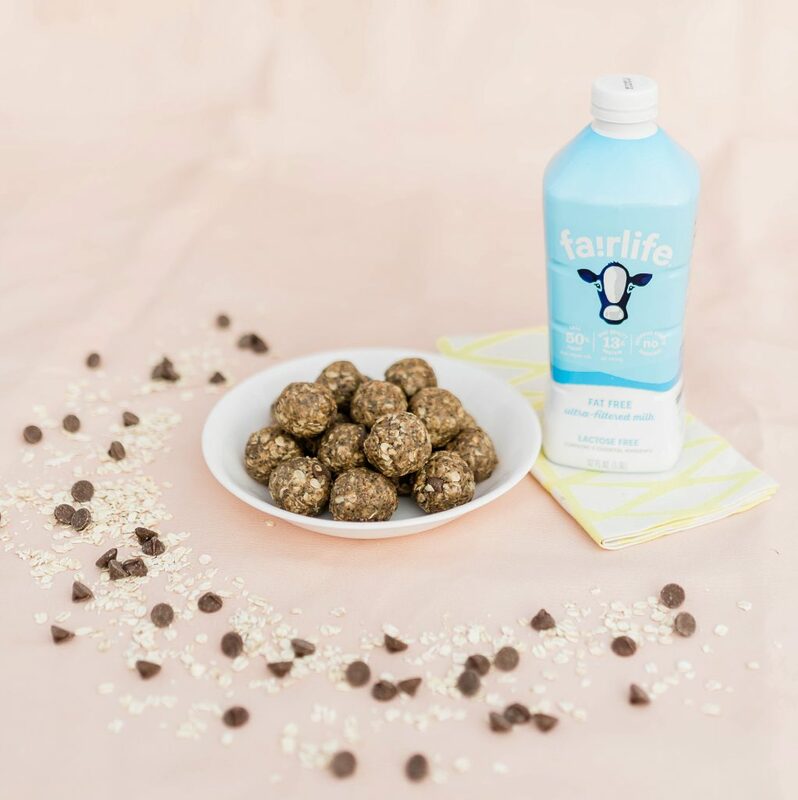 AND other competitors add protein powders or synthetic junk to make milk more ‘nutritious” but fairlife’s filtration concentrates the natural protein and calcium without needing to add from outside sources. fairlife filtrates 1/2 the sugar, takes out the lactose, provides 13 grams of more protein compared to 8 grams found in ordinary milk, which is more digestible and absorbent to the human body. I already knew cow milk wasn’t the best for humans and many people have a hard time digesting it, and fairlife makes it so that it is more healthy to consume for humans. I am totally okay with that! Since the lactose is taken out, all the lactose-intolerant people are okay to drink any of the fairlife ultra-filtered milk. They really spoil their cows. It was the cutest hearing Sue refer to her cows as “her girls”. The place is cleaned 3 times a day, there was no smell of poo or any unpleasant odor, no flies, no bugs, I was so surprised at how clean it was! They grow their own crops and never treat their cows with rBST growth hormones. This was my favorite thing about their farm, at their flagship farm in Fair Oaks, Indiana, they convert cow ma-nure into methane to power their dairies and then turn it into Com-pressed Natural Gas to fuel their fleet of 42 CNG powered tractor trailers. This innovation eliminates 12 million miles of fossil fuel emissions annually, how awesome is that? The Fair Oaks Farms goal is to have a zero carbon footprint, because they know that the better we treat our soil, air and water, the better it will deliver the food we depend on. Aren’t you so impressed? I have so much respect for fairlife and I am now a forever fan. After learning all this, if their milk didn’t taste good, there’s no way I would drink it or support it, but their milk is delicious. Sue said many people whom are older have told her that it tastes like the milk they used to drink straight from the cows when they were growing up. And here is a video that I took of the trip! This post is sponsored by Ace Hardware. Make sure to enter an Ace Hardware $150 giftcard below! 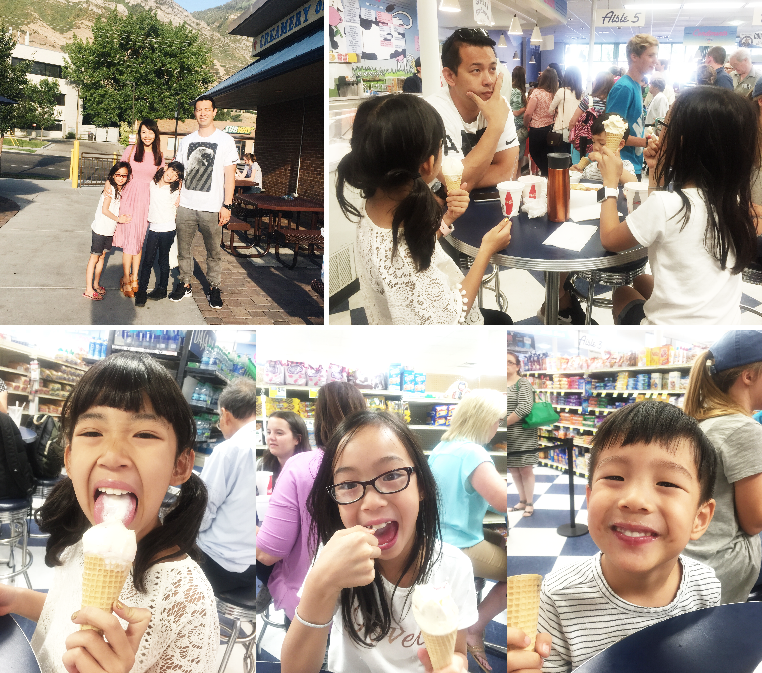 The girls had their first day of school yesterday so as per our family tradition, we went to BYU Creamery for some ice-cream! I didn’t feel like cooking dinner so we also grabbed some burgers, fries & even soda as well at the diner which the kids were very happy about. I still can’t believe how fast this Summer went by. Do you feel like it went by fast for you? Every mom I’ve talked to has told me the same thing, how this Summer went by faster than any Summer they’ve ever had! Part of me has been very excited and a part of me has been a little sad about how fast Summer went by. There were so many things we didn’t get to do such as camping a ton! By the time I realized Summer is almost over and we only had 2 weeks of Summer vacation left, we went and did a lot of fun stuff such as going to the Leonardo Museum, swimming, and we even squeezed in a little camping trip this past weekend, the weekend before school started. Some things I will miss about Summer are drinking smoothies as breakfast and lunch with my kids because it’s so hot you don’t have an appetite, eating popsicles outside in our front yard while sitting on the grass, and all the fresh fruit! Wait, why are all these about food? Haha. 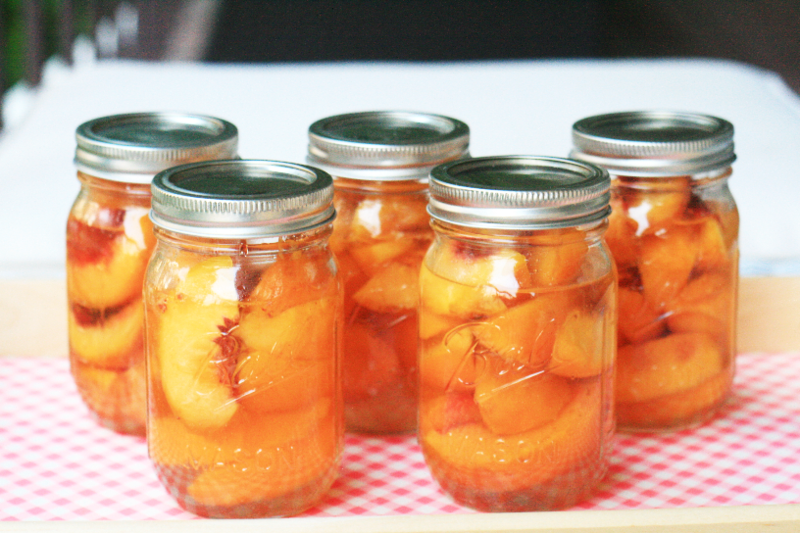 So I thought a great way to preserve the memory of the awesome Summer we’ve had is to can some peaches we’ve been eating like crazy this Summer.
! It was so much easier and less intimidating than I thought. 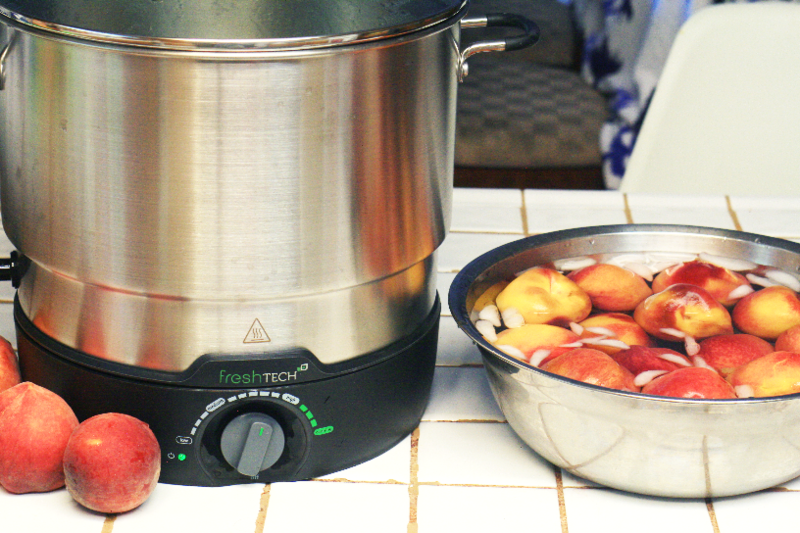 it up, sanitize and use the Ball® 21 Quart Electric Canner. Wash jars and bands in hot, soapy water. Cover lids with hot water according to package directions. Place jars on rack in deep pot of boiling water. Turn off heat and let jars stand in hot water 10 minutes or until ready to fill. 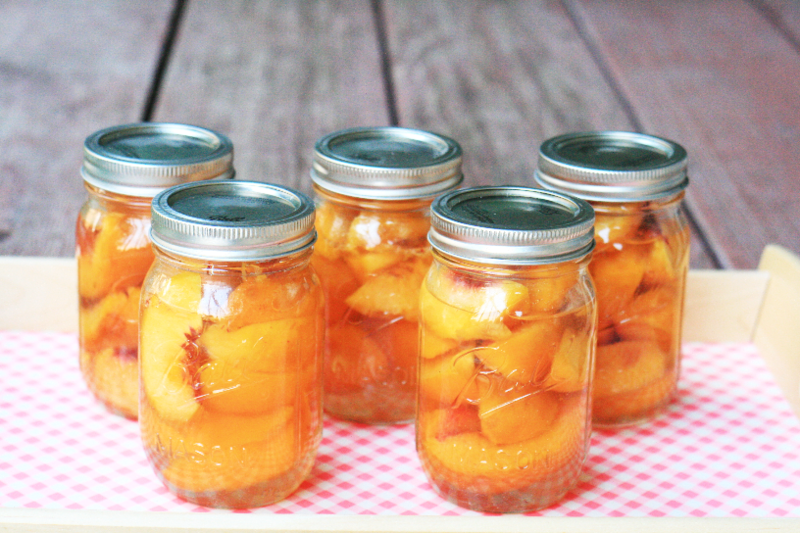 To prepare peaches: Wash peaches; dip in boiling water for 30 seconds, then drop in ice water to loosen skins. Remove skins. Cut in half; remove pits and scrape away the red fibers around the pit, which can darken during storage. 25 minutes for pints, 30 minutes for quarts. Remove jars from hot water and place, not touching, on dish towel. Cool several hours or overnight. Test seals before storing. 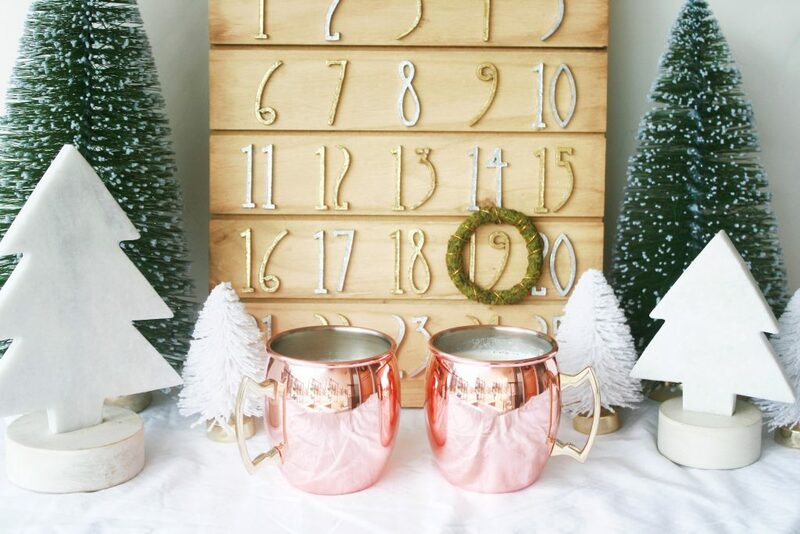 To get you started on your own canning, one of you will win a $150 giftcard to Ace Hardware! Fill out the Rafflecopter below, best luck! The giveaway ends on September 14th. Best luck! 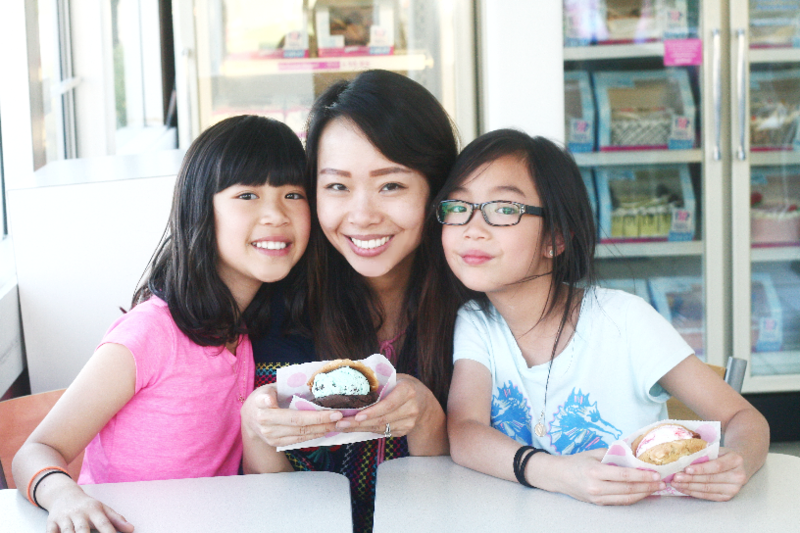 This post is sponsored by Baskin-Robbins. I am sharing with you one of my most treasured memories made there!